Insomnia (1997) Review: An unremarkable detective-thriller – AiPT! Insomnia unfortunately falls below par in most aspects. The detective-thriller style of films aren’t breeding originality. We’ve seen many come and go. Some offer complex characters to compensate for a common plot (Silence of the Lambs, Prisoners), some offer up interesting motives or patterns within their protagonists/antagonists (Se7en, Shutter Island), and some just refuse to produce anything new (Gone Baby Gone, The Snowman). Insomnia unfortunately falls below par in most aspects. The film set my expectations high right from the first few minutes. A well-edited montage of the killing and cleaning of a woman starts the plot off with a bang, and begins to set the mood in place. This montage has a grainy, poor quality camcorder look about it, giving me the presumption that this could be a film that will sway me with it’s visuals. It’s backed by a perfectly minimalist electronic score that creates a thick layer of dread, which was the thing that got me really hyped. Everything that was so enticing about the opening segment goes up in smoke in the next five or so minutes. Music almost completely disappears. It’s either absent, or too quiet to actually make a difference to the on screen emotions. Many scenes could have benefited greatly from a prominent score, but for some reason the filmmakers put it at the way, way back of their priorities. The minimalist keyboards really do drain the life out of the scenes where it is noticeable, which is perfect. I mean, a few spaced-out prods at a keyboard made me remember the first minute or two, so why did they stop? I’m not saying all films need a score, but Insomnia’s detective-thriller story could have been separated from many others with such an aspect. Overall, it’s a bit of a missed opportunity that could’ve boosted dramatic tension. Compared to anything shown in the opening segment, Insomnia’s actual plot is a completely different beast. Actually, I don’t think it can be classified as a ‘beast’. It has more similarities with a puny rodent. The first twenty minutes of plot was concerning, to say the very least. Insomnia shows itself as a stripped down to the bone version of all detective-thrillers. There are cliches aplenty in this section of the film, but not enough for it to be laughably bad. Instead it’s just plain boring. We are introduced to Jonas, a Swedish-born detective that arrives in a Norwegian town to conduct an investigation on the death of a young girl. His defining traits are… pretty much non-existent. If I were to place a label on him, I would call him ‘stone-cold’, but that is probably just me mistaking his bland-solemnity for a personality. 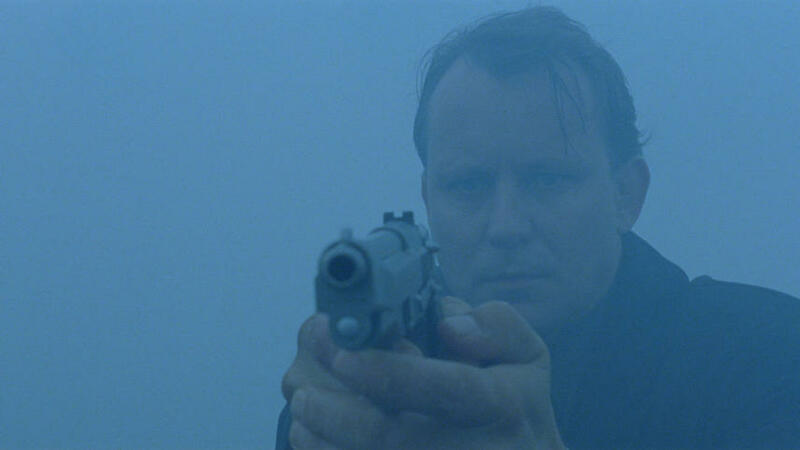 Take any detective from any other film and put them through a compressor, and you’ll have Jonas Engström. An overly-serious lump of a character, Jonas wanders around the settings doing standard detective work, and deals with some mental stuff on the side. I’m not downplaying any of this. ‘Mental stuff’ is the correct amount of detail I should go into, as it basically consists of Jonas not sleeping and being sweaty during the last half of the film. I often found myself fascinated with the things that are less connected to Jonas, such as the side characters and mise en scene, but I can’t say he didn’t have his moments. Drastic actions are common plot developments throughout the runtime, and Jonas portrays them to solid effect, although not always with high finesse. All in all, as a central figure, Jonas just doesn’t compete with the other detective-thriller protagonists. The script isn’t too innovative or interesting as a whole, and struggles to make the characters complex, leaving the film in a bit of a limbo between mainstream and artsy film making. The film plods along for those first twenty minutes, until a major plot curve arises. This is Insomnia’s stab at a unique concept, and it’s unfortunately another sub-par effort. This development involves the sudden death of a character, that mentally damages Jonas. The death of the character is portrayed in a way that really spiced things up and revived my interest. Insomnia turns into a bit of a psychological cop-thriller at this point, but this change doesn’t happen in the smoothest of fashions. First of all, the death was pretty predictable. The killed-off character was utterly killing-off material. He was present since the opening credits, but was never really a focus at any point, and tags along with Jonas pretty quietly. Minimal character development and a tooth-floss thin reason for inclusion, are two big signs that he was going to be killed off. Jonas is deeply troubled by the death, and it affects him greatly throughout, making him a bit more enjoyable to watch, but still doesn’t fix his blandness. For the damage that is caused to Jonas, the dead character wasn’t tied to him as much as he needed to be, but all in all, Jonas’ struggles with the loss still provide a watchable experience. The final resolution is quite fitting, considering what it had to tie up. It’s a ‘bad ending’ that explores some of the least favorable outcomes, a very artsy decision. It is a little flat, and wastes much of the rising tension, but it could’ve been a lot worse. Jon Holt, the villain of Insomnia, is simply uninspired. His motives, actions and his dialogue are bland. Even the resolution he meets is dull. A lot of the time, he is the reason the film seem so workman-like, even more so than the main character. Jon is given the occupation of an author, which ends up as just an excuse for him to make a crap writing-related monologue. Although he isn’t the complete focus of the plot (and rightly so), Jon is still a bit of a chucked together antagonist, that could have been fleshed out better. The visual aspects of Insomnia marginally make up for the imperfections in the story. The cinematography is slightly above par compared to other detective films, and is the only aspect that consistently stood out to me. Movement shots are managed in a way that accentuates patterns in the framing. For example, there are a few parts in the film where the camera adjusts it’s position to place three characters in a obviously structured manner. The camera often sweeps around the room in horizontal 45° turns, which give a clear idea of the position of people and objects around the room. Fog is taken advantage of in one scene in particular, meshing well with the ominous minimalist score (when it’s present). The inability to see much of the environment adds a perfect layer of danger and tension to the scene. The one issue I have with the cinematography are the unsteady shots. You can definitely tell when a handicam is being used because the screen turns to mushy mess of colors. Overall, Insomnia lacks a defining plot feature to separate it from the many other detective thrillers, making it feel incredibly unremarkable. Insomnia lacks a defining plot feature to separate it from the many other detective thrillers, making it feel incredibly unremarkable. And the Golden Globe for best drama goes to…’Black Panther’?